Here it is, a pattern as requested by so many. 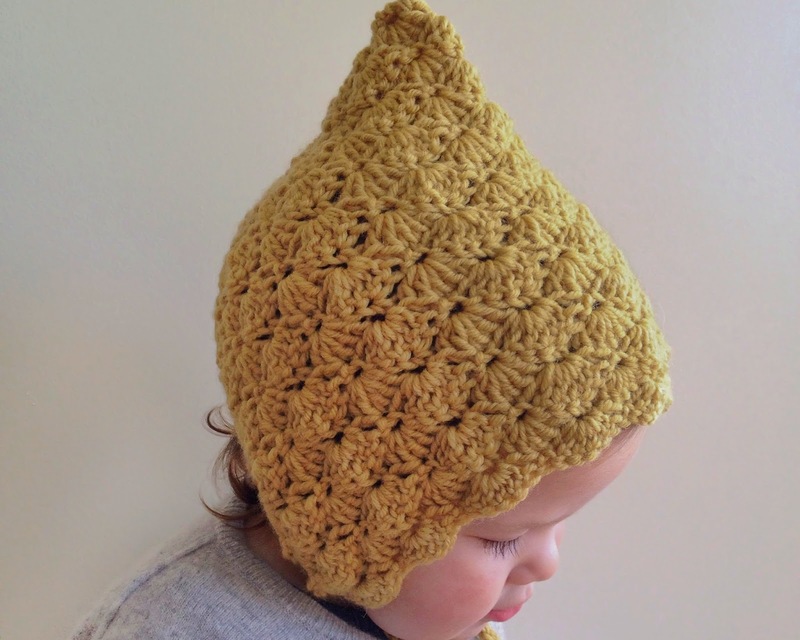 Once again, its taken me forever to get around to sharing this sweet little bonnet pattern with you. I'm sorry, but here we are, better late than never.. This is one of the quickest little things you'll ever whip up, and trust me, you won't stop at just one! When working a shell stitch we work in increments of 6 (one shell for every 6 chains). This pattern is based on a size 6-12 month. For larger sizes simply make your foundation chain longer, generally by 6 chains for each size up, and then additional rows to suit. 1 double crochet (dc) into the second last ch, skip 2 ch, 5 treble (tr) into the third ch, skip 2 ch, 1 dc into the third = one shell. Continue this until your bonnet is at the required length, approximately 16 rows for this size, be sure to allow enough yarn for stitching up your seam. To stitch up your seam, fold the bonnet in half so that each row is lined up, it'll look like a square, then thread with your tapestry needle along to join. If you are careful, the seam will be almost invisible. Tie off, weave in the ends. For the tie/cord, simply make a chain to the required length. Fabric or ribbon would be nice too. Then weave the tie along the base so that there is enough either side to pull into a bow. There you have it, snug as a cute little bug! *the size of your hook can vary depending on your yarn and wether you generally work your tension tight or loose, it can vary from one person to the next. **I like to treble 3 at the end as it gives the work a neater finish. Thanks heaps for this pattern! !